There can be many causes of disrupted breathing during sleep, and one of them is central sleep apnea, but what is central sleep apnea? It may lead to pauses in nighttime breathing, but because the underlying cause is distinct from obstructive sleep apnea, it requires specialized treatment. Discover the most common symptoms, causes, diagnosis, and preferred treatments (such as bilevel therapy) of central sleep apnea. Central sleep apnea is a breathing disorder that occurs during sleep and results when the brain fails to activate the respiratory muscles. This leads to a brief pause in breathing that may last 10 seconds or longer. Unlike the more standard obstructive sleep apnea — which is caused when the upper airway becomes temporarily obstructed — in central sleep apnea, the effort to breathe stops and there is no clear obstruction of the airway. Though the cause is slightly different, the outcome of central sleep apnea is the same. Apnea comes from the Greek and means "no breath". As such, it is associated with drops in the oxygen levels of the blood. The brain detects this and there is an effort to wake the afflicted person in order to restore breathing. Witnesses may observe noisy or irregular breathing at night and may even see pauses in breathing. The apneic event leads to a brief arousal from sleep. As this occurs repeatedly during the night, it leads to fragmented sleep and less deep sleep. This may result in insomnia and excessive daytime sleepiness. The exact cause of central sleep apnea is not known. The respiratory control center in the brain normally regulates breathing. If carbon dioxide levels are reduced below normal or if there is damage to neural pathways involved in respiratory control, there may be disruptions in breathing. As mentioned above, unlike in obstructive sleep apnea, the airway is not blocked. Central sleep apnea often occurs in the transition between sleep and wakefulness, but it may also persist into the light stages of sleep called NREM. It may sometimes occur after an awakening and is called a post-arousal central in this case. The instability of respiratory control is often seen in multiple neurologic disorders, including Parkinson’s disease and multiple system atrophy. It may be seen after a stroke, especially if the brainstem has been damaged. It may also occur in association with the Cheyne-Stokes breathing pattern seen in patients with congestive heart failure. It may occur more commonly among those who use narcotic or opioid pain medications. Fortunately, in this case, it will resolve with discontinuation of therapy. It is important to differentiate central sleep apnea that develops in response to continuous positive airway pressure (CPAP). It may be worsened if pressures are too high. This is called complex sleep apnea. In 98% of cases, this type of central sleep apnea will resolve in time, often several months, with continued treatment. It does not require other changes in therapy. Central sleep apnea can be diagnosed with a standard sleep study called a polysomnogram. This will demonstrate recurrent pauses in breathing during sleep with a lack of effort to breathe. Cloth belts wrapped around your stomach and chest are used to measure breathing effort. They contain a sensor that can detect movement, and in central sleep apnea the effort will decrease or stop entirely. It will also be possible to document drops in blood oxygen level and changes in the EEG suggesting sleep fragmentation. 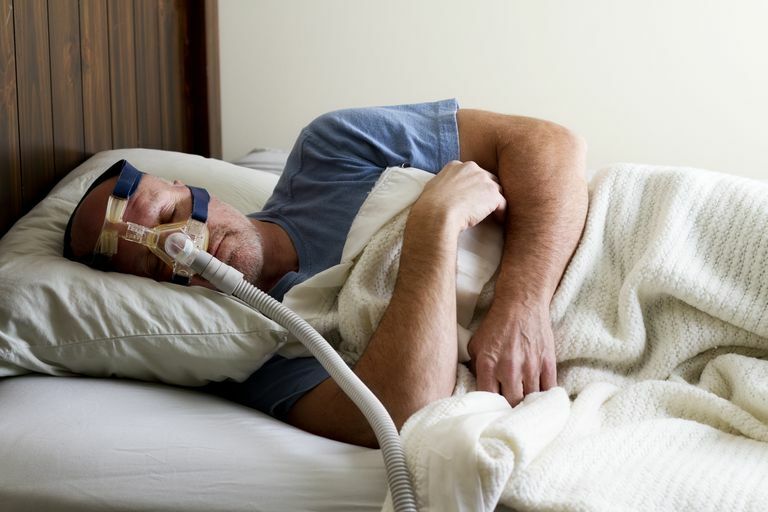 Treatment is typically accomplished with bilevel therapy (sometimes called BiPAP or VPAP) by providing a flow of air delivered through a face mask worn while sleeping. The prescribed pressure alternates between two levels: one to breathe in (IPAP) and one to breathe out (EPAP). The air is pressurized by a small machine and delivered through plastic hosing to the mask. Oxygen may also be used. Some devices are capable of delivering an extra breath if long pauses in breathing our observed. In some cases, adaptive or auto-servo-ventilation (ASV) may be indicated. If you are concerned that you may be experiencing central sleep apnea, speak with your sleep doctor about your treatment options. Mowzoon, N et al. "Neurology of Sleep Disorders." Neurology Board Review: An Illustrated Guide. 2007; 726.